Suggest a new resource for ASGA’s web site, provide a solution to a problem or issue, or offer an idea that will help other ASGA members. Please complete and submit the online form below. You will receive an automated confirmation message. Alternatively, you can download the form PDF, then either 1) print out and FAX the completed PDF to 352-373-8120 or 2) e-mail the completed PDF to info@asgaonline.com. You will need the latest version of Adobe Acrobat Reader to view, fill out and save the completed PDF form. *Subject to approval. One free registrant per ASGA member school per year. 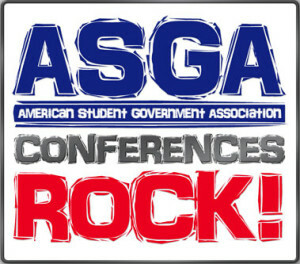 Conferences exclude the National Student Government Summit.